I have been looking for a polka dot top for several months. In my search, I stumbled on these look-a-like tops. There are differences, to be sure. But with the pattern and sleeve similarities, I think the Forever 21 top is a great option (and a bit more modest to boot). What do you guys think? Is this something you would wear? I actually like the F21 better. I actually like your find better than the J.Crew top! Great find! 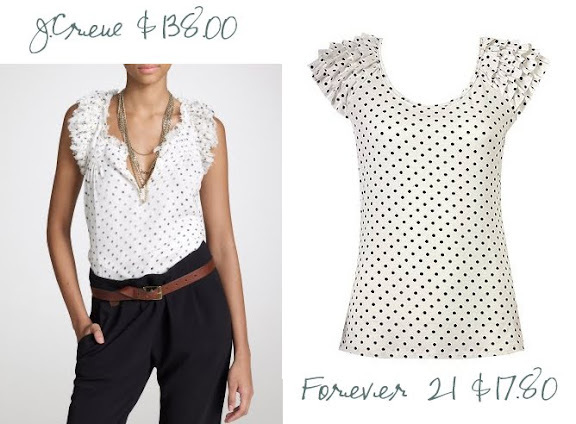 although i like that the j.crew one is a bit dressier, i love the F21 too, and it's price would totally win me over! I love both! Got to hand it to F21 for copying everything and making it so affordable! I love it! The ruffled sleeves are too cute!